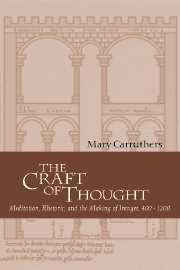 A companion to Mary Carruthers' earlier study of memory in medieval culture, The Book of Memory, this book, The Craft of Thought, examines medieval monastic meditation as a discipline for making thoughts, and discusses its influence on literature, art, and architecture, deriving examples from a variety of late antique and medieval sources, with excursions into modern architectural memorials. The study emphasizes meditation as an act of literary composition or invention, the techniques of which notably involved both words and making mental "pictures" for thinking and composing. 1. Collective memory and memoria rerum; Part I. An Architecture for Thinking; Part II. Memoria Rerum, Remembering Things: 2. 'Remember heaven': the aesthetics of Mneme; 3. Cognitive images, meditation, and ornament; 4. Dream vision, picture, and 'the mystery of the bed chamber'; 5. 'The place of the tabernacle'.